Today I started Peacock Moon. 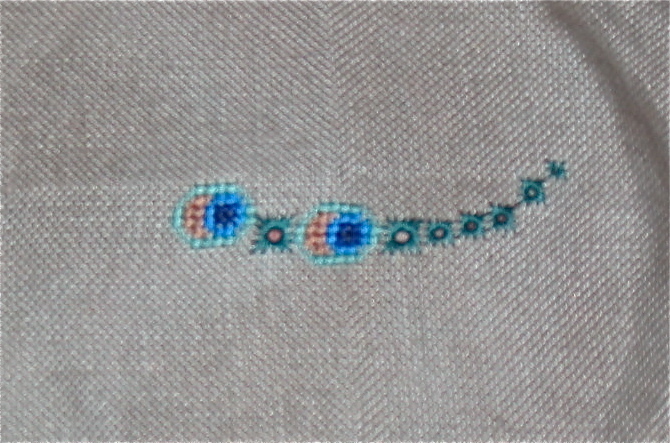 This will be fun to stitch, I love all the bright blue eyes of the peacocks tail. I can’t wait to get back to this project after I have started the rest of the challenge projects. The other project I am working on today is a Band Sampler RR from the TWWRR group. It is coming along and I only have a couple more days to finish my part so I decided to put down my cute peacock and get back to work on the RR. I will post a picture after I’m done.